My roommate, Emily, turned 21 on September 21st, but because it was a Monday evening, we decided to celebrate with a small dinner party. There was a lot of great food involved – spinach salad with blue cheese, craisins, and candied pecans, mushroom tortellini in an alfredo sauce – but the best dish definitely was the appetizer, a baked brie with walnuts and honey. Emily always gets Le Parisien salad at SweetGreen which has arugula, brie, pears, and almonds, so even though she isn’t a big cheese fan, we thought it’d be a good idea. Plus, the recipe is super easy and we already had the ingredients on hand. It was even more of a success than we thought it would be. Some of the guests proclaimed themselves to be anti-French food, but that didn’t stop them from helping themselves to extras. Within 10 minutes, the entire wedge, walnuts and all, was wiped clean from the plate and the rosemary garlic crackers were gone. 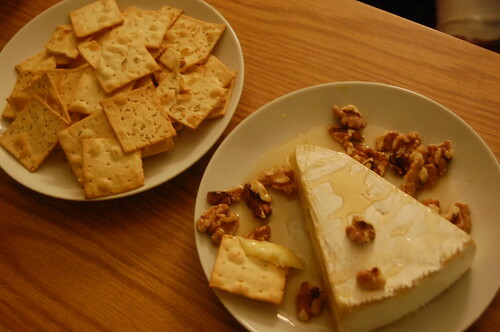 Preheat oven to 350 F. Set the wedge of brie onto an oven safe serving platter and scatter with walnuts. Drizzle with as much honey as desired. Put serving platter on sheet pan and bake for 6-8 minutes or until the brie has started to ooze but not melt. Serve with crackers or slices of French baguette. You are currently reading Baked Brie at Emily’s 21st at Notes on Food.